Mix the gram flour and semolina together. To this add the grated ginger, lemon juice, 1 tsp. sugar and salt. Now slowly add water to make a batter, ensuring no lumps remain, whisk well. Batter should not be too runny or too thick. Keep this batter aside for 20 minutes. After 20 minutes, stir the batter and add a little water if required. Otherwise add the eno fruit salt and give a gentle stir to mix in the powder. Do not stir a lot. 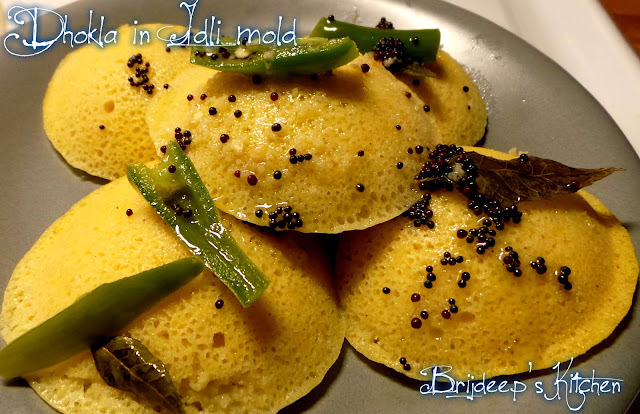 Keep aside for about a minute in which you will grease the idli molds with little oil. 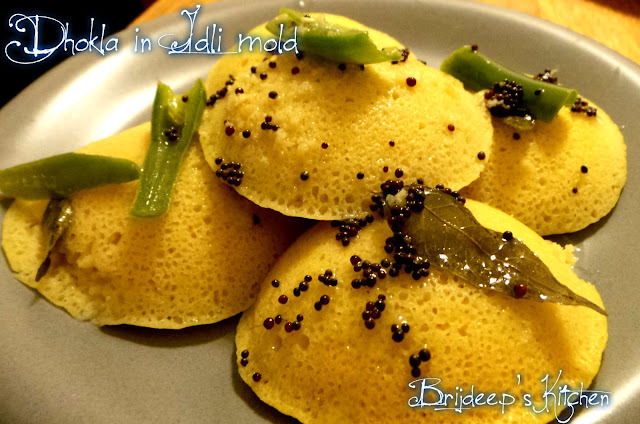 Slowly add the batter in the microwavable idli mold and steam it on high power for 3 minutes. Remove from the microwave and let sit. By the time, make the tempering. Heat oil in a pan and add the mustard seeds. When they crackle, add the green chilli and curry leaves. Mix and let cook for about 2 minutes. Add a cup of water and stir in the remaining 1 tsp. sugar. Bring it to a boil and turn off the flame. 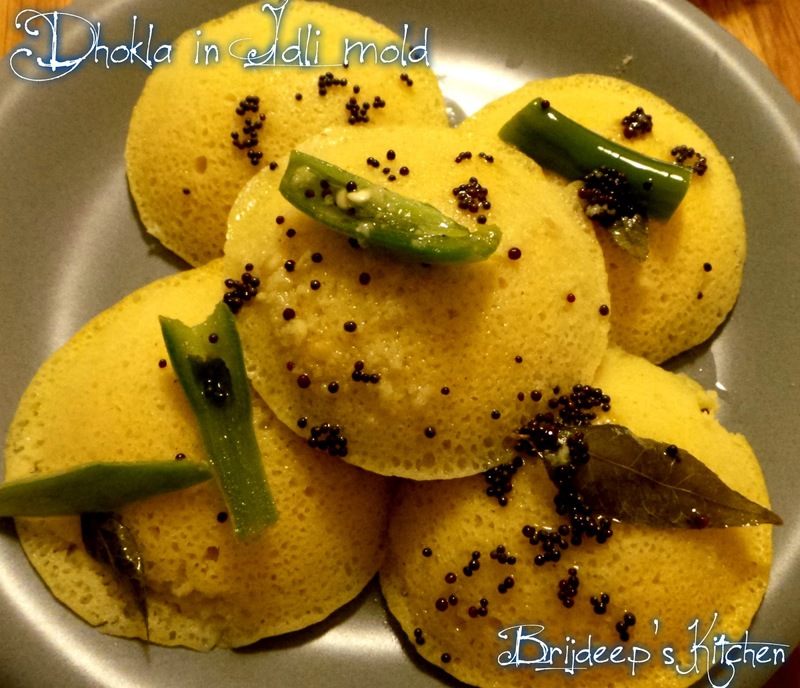 Remove the dhoklas from the molds and place on a flat serving tray or plate. Pour the tempering over the dhoklas. Let sit for about a minute for the dhoklas to absorb water and become spongy. 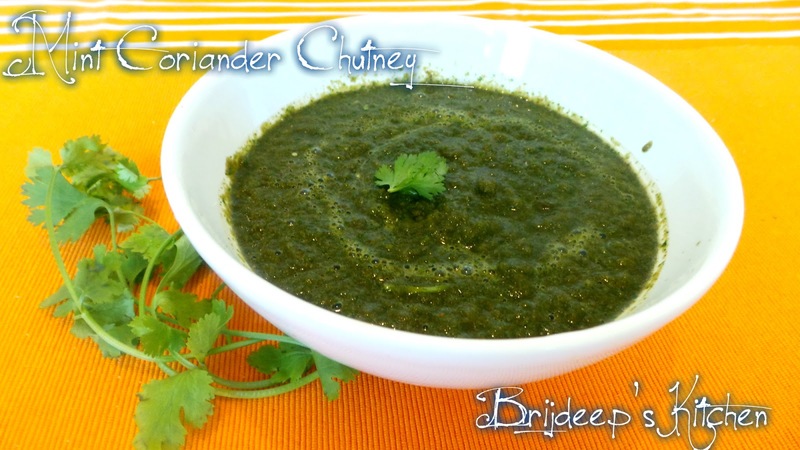 Serve with Mint-coriander chutney and hot steaming tea !! Loved this recipe? Please leave a comment/feedback and don't forget to join my Facebook Page for regular recipe updates. You might also like 3-minute microwave dhokla and 3-minute rawa dhokla recipes. Are you adding a cup(250 ml) of water to the tempering? Will the dhoklas absorb that much water? just curious as I never made them before but want to give it a try today? Hi. Yes that's the amount of water I use for the amount of batter I mentioned above. Dhoklas absorb water and that's what makes them spongy, soft and fluffy. You will notice it has pores when you steam it but will become soft only when tempering is added. I'm adding a cup water and then bring it to a boil so the amount of water would be reduced while boiling. If you still feel the water is a lot, you can add slowly to the dhoklas and keep adding little amounts, you will know if they absorb all the water or no after first few times; it all depends on a lot of factors like the type of sooji and besan used etc. Tried this today and it was a total disaster. I followed the recipe to the T and the dholkas feels like rubber and tastes like Eno. 1. Did you keep the batter for 20 minutes and let it sit? 2. How much of the eno salt was added? Was the eno flavored or plain? Did you mix the eno well before pouring into mold? 3. You needed to microwave for 3 minutes on HIGH power... what is the high for your MW? Mine is 750W. 4. Did the dhoklas felt like rubber after tempering? Did you skip sugar? Was the tempering water boiling? Did you add less water? These all factors contribute a great deal. Please reply so I would be able to help you more.. Thanks. Secondly thanks a lot for your appreciation and I'm happy to hear that you love the recipes.. this motivates me to write more. Hi Rashmi, you can use raw sooji, no need to fry it... also I have tried this recipe both with coarse and fine sooji and both times the dhoklas come out really perfect, so you can use any of those. Just remember if using coarse sooj, it will absorb more water so you need to add a little more water in tempering. 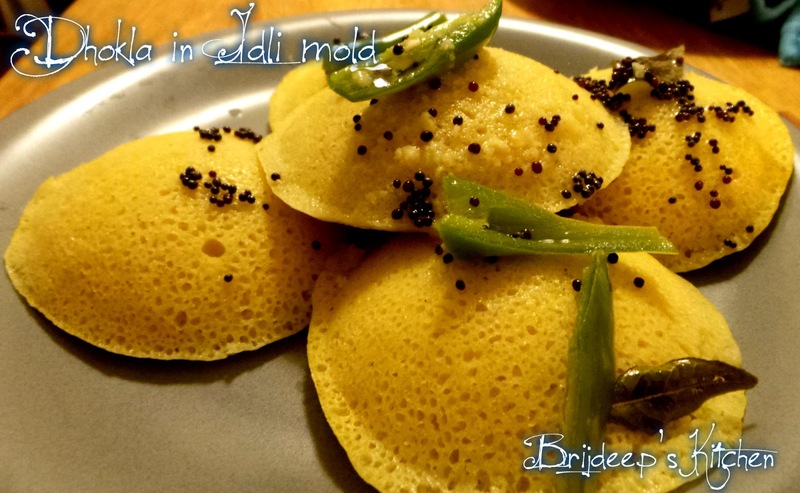 Hi Brijdeep, I would like to try your recipe. But one cup of water in tempering made me confirm it again, is it 1 cup = 8oz water, isn't it too much?